Paddle your way through the mature floodplain forest and rich backwaters of the Upper Mississippi River National Wildlife and Fish Refuge while admiring the panoramic views of the towering bluffs. Bird watchers, river lovers, and anglers will cherish the diversity that will greet them at every turn. The 4.8 mile Nelson-Trevino Canoe Trail located between Nelson, WI and Wabasha, MN is a treasure of the Refuge. The trail is free and open 24/7 during ice out conditions. Camping is available on river islands and beaches on a first-come-first-served basis. Location: In the Winona District of the Upper Mississippi River National Wildlife and Fish Refuge. The trailhead is on Hwy 25 between Wabasha, MN and Nelson, WI. From Wabasha, MN take Hwy 25 east across the Mississippi River bridge to the Pontoon Slough Boat Landing (on the right). If coming from Nelson, WI, take Hwy 25 west toward Wabasha, MN. Pontoon Slough Landing is located on the south side of Hwy 25 (on the left). The 4.8 mile Nelson-Trevino Canoe Trail is the first (upstream most) in a series of four trails designed to take paddlers into the backwater areas of the Upper Mississippi River National Wildlife and Fish Refuge. The trail access is located on Hwy 25 between Nelson, WI and Wabasha, MN. This trail does contain flowing water but does not follow the main navigation channel. Paddlers who wish to paddle to the second trail, Finger Lakes Canoe Trail approximately 8 miles down-river, will need to use the main navigation channel and "lock through" Lock and Dam #4 (paddlers unfamiliar with the procedure for using a lock should download the booklet “Locking Through” available at the refuge website). Sandy beaches for camping are plentiful along this section of river. There is no fee for camping on the Refuge. The Nelson Trevino Canoe Trail is located near the headwaters of the Upper Mississippi River National Wildlife and Fish Refuge. This trail was developed as an Eagle Scout project in the summer of 2010 and has provided paddlers with incredible fishing, breathtaking views and bird watching opportunities. These aspects and many others were the driving forces behind this section of the Mississippi River's designation as a Ramsar Wetland of International Importance in 2010. The trail has two loops, the longer loop will take paddlers under Hwy 25 and into the Nelson-Trevino Research Area. The adventurous paddler is welcome to go off the trail and explore the Nelson Trevino Natural Research Area. The 3,700 acre Research Area is a spectacular maze of channels and old growth floodplain forest. The area is designated as a Wisconsin State Natural Area and Scientific Area, a U.S. Forest Service Federal Research Area, a National Park Service National Natural Landmark and is part of the National Wildlife Refuge System. A GPS unit and map are recommended for paddlers venturing off the trail in the Nelson-Trevino Research Area. 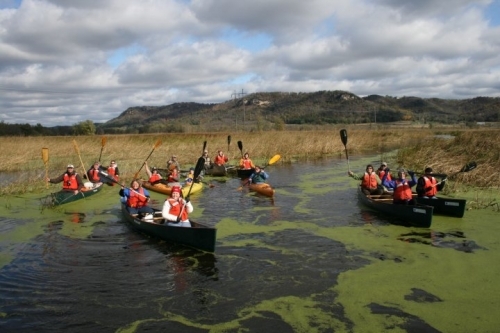 The Nelson-Trevino Canoe Trail is one of four canoe trails located on the Winona District of the Upper Mississippi River National Wildlife and Fish Refuge. Spend a few days exploring the river and its unique communities! Paddlers can pull up to the docks in front of the National Eagle Center in Wabasha, MN to view eagles up close and personal. Paddlers continuing down-river to the Finger Lakes Canoe Trail can also enjoy off-river camping, restaurants and shopping in Alma, WI (River Mile 753). All canoe trails are free and open 24/7 during ice-out conditions. Fall is spectacular for colors but paddlers should dress brightly as all the trails travel through areas open to hunting. Services are available near the trailhead in both Wabasha, MN and Nelson, WI. Additional information and maps can be found at the Refuge website www.fws.gov/midwest/uppermississippiriver.